Growth at a Reasonable Price (GARP) is a strategy that aims to highlight companies that are growing but still reasonably priced by the market. 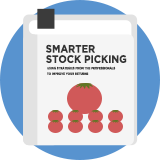 It's an approach suggested by journalist and investor David Stevenson in his book, Smarter Stock Picking. It uses a combination of value, growth, quality and momentum measures. They include earnings-per-share growth, a below average price-to-earnings ratio, a high return on capital employed and a share price with positive relative strength. David Stevenson says: "At the core of GARP is is a simple desire: to benefit from a double whammy of growing earnings and a growing PE ratio that reflects this growth of earnings." This screen implements the generic GARP approach outlined in David Stevenson's excellent book, "Smarter Stock Picking".